As the summer winds down, children groan, parents rejoice, and school season is once again upon us. Many children and young adults commute to school on their bikes and more join the ranks nearly every day. Unfortunately more and more bikes are stolen every day as well. What is the best way to secure your bike and which lock is the right lock for the job? We're here to help you out by investigating the different locks and showing you the best way to secure your bike. Cable locks are light, easy to use, and offer relatively good safety. Cable locks come in a variety of thicknesses from incredibly lightweight retractable locks from Kryptonite and Master, to 12 millimeter heavy weight cables. 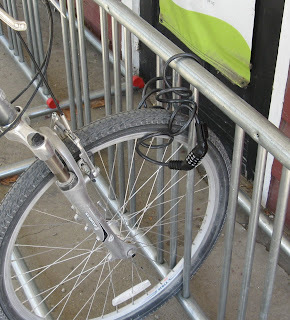 The down side of cable locks are that they can be cut with bolt cutters, if you have a determined thief, but for low risk areas these locks offer reasonable security and light weight for easy transportation. Cable locks come in either a keyed lock or a combination lock, if your child is as prone to losing things as mine the combination lock tends to be the best bet, providing it's a complex enough combination to be hard to guess but meaningful to your child. Securing the bike can be done in one of two ways, the right way or the wrong way. The right way is to make sure the frame is secured to some stationary object, otherwise if the cable is simply through the front wheel the wheel can be left and the rest of the bike taken. 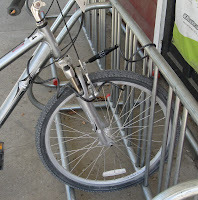 If just the bike is secured and not to some permanent object, like a bike stand, the entire bike can be taken. Pictures below show the correct and incorrect usage of cable locks. U-locks are made of hardened steel and act similar to a smaller Master lock. The U-should be used to secure the frame and wheel to a stationary object. U-Locks advantage is that they cannot be cut with bolt cutters, and that without an acetylene torch and a lot of time the lock is not going to be cut. 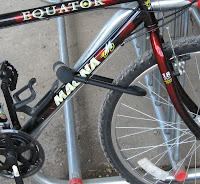 A further strength of U-locks is many U-lock manufacturers offer insurance or value protection for stolen bicycles, reimbursing the owner if the bike is lost or stolen by breaking the lock. This makes U-locks ideal for higher risk areas and for bike messengers and the like. The drawback to a U-Lock is they are very heavy, unwieldy and can be difficult to transport. 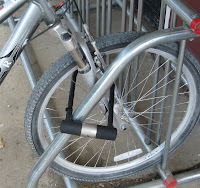 The photos below show the correct and incorrect ways to secure your bike with a U-Lock. Finally for the best security the best way to secure your bike is with a combination of U and cable locks. This is ideal for high risk areas where not only is the entire bike at risk but so are the wheels. Using the combination of U and cable allows the frame to be securely attached to a stationary object and the wheels to have further security to keep them attached to the frame. The combination of U and cable is also good for the frame which will not allow the U lock to attach wheel, frame and stationary p ost as shown below. Finally one last word about security. No lock is perfect, even with unbreakable materials attached to immovable objects, if the thief can get the key, or get the owner to reveal the combination the bike will be stolen. 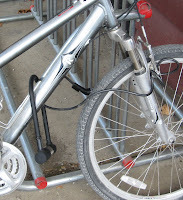 Likewise no bike is secure from the determined thief with enough time and a truck to wheel the bike rack and bike away. However by choosing the correct lock for your situation, and attaching it correctly your chances of losing your bike to theft are greatly reduced.